Now that I’ve retired I’ve found myself making more time for quality television, and “yes” there is such a thing. The old days of wasting hours and hours of my life with “drama” TV has been replaced with more interesting and educational programming. In recent months I’ve become a HUGE fan of American Pickers, a show dedicated to the pursuit of “rusty gold”. I’m pretty sure that it’s the adventures of Mike & Frank (and sometimes Danni & Robbie) that has changed my perspective on looking for the unusual, and you might be very surprised where you may find it. I’ve spent the last 30 years hanging out in central Kentucky, frequenting such exciting places as Bowling Green, Munfordville and home of the Highland Games, Glasgow. 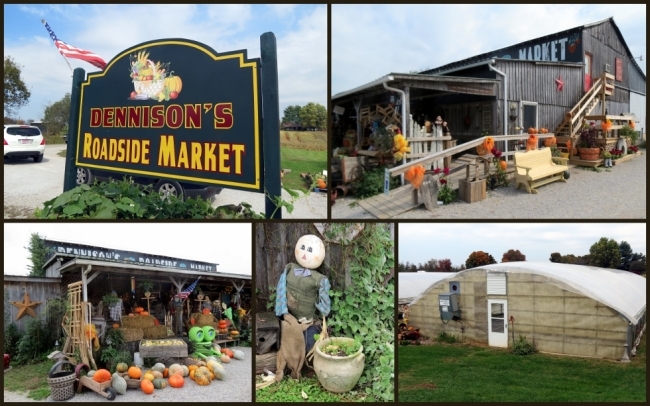 It turns out that there’s a place that’s been in business for over two decades, just a few minutes drive from Glasgow that I never knew even existed, Dennison’s Roadside Market, just outside the small town of Horse Cave. While traveling north on highway 31-E one day, my wife and I saw it by the roadway and were immediately drawn into the parking lot. 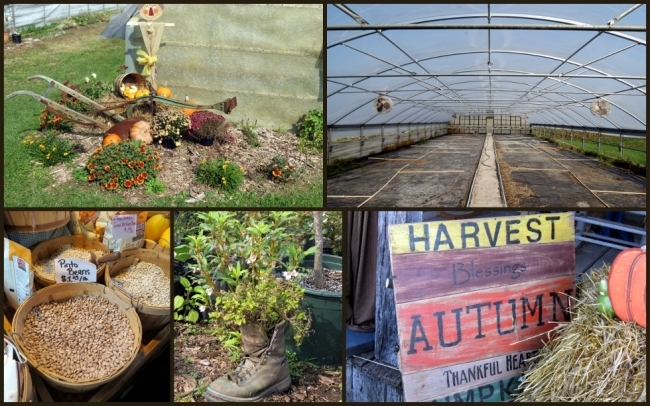 There’s just something about greenhouses, blooming flowers, tons of produce and rustic odds & ends that works for me. For the record, I was not “picking” in the literal sense, but like the folks on American Pickers the old does draw me in. 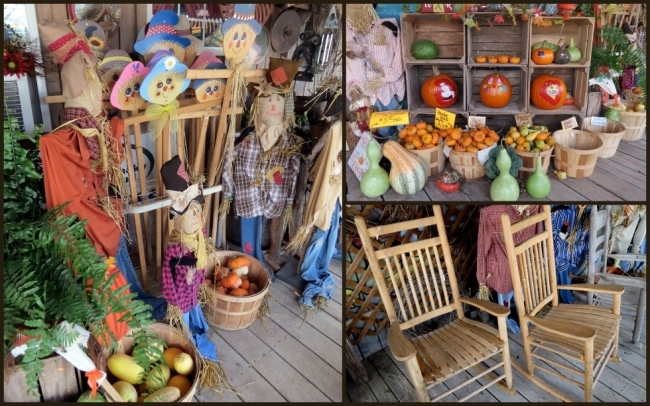 The porch alone was enough to get my attention, sort of a cross between an old country store and a more modern tourist attraction, well done might I add. The multiple signs and obviously handmade treasures did the job. As soon as you enter Dennison’s you know you’re in a place that’s very special. 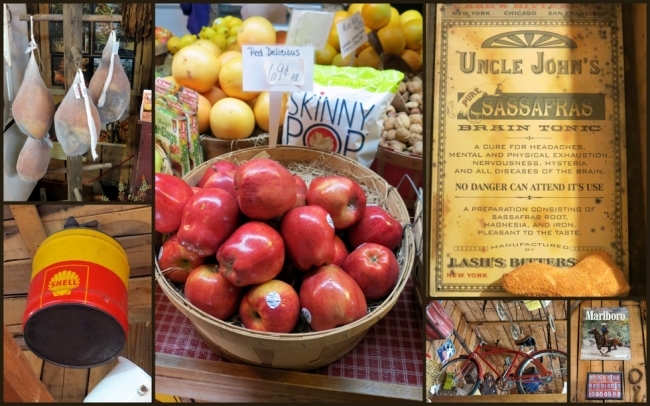 Not only do they have tons and tons of awesome produce, you’ll find other homemade treats just waiting for you. 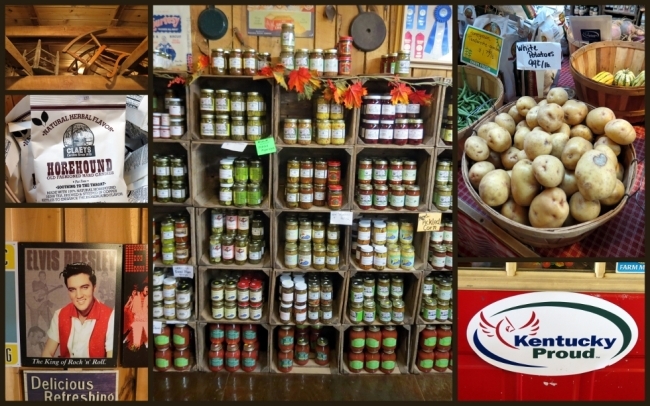 I was more than a little impressed with the selection of jams, jellies, baking products, country hams and just about everything else good to eat here in Kentucky. 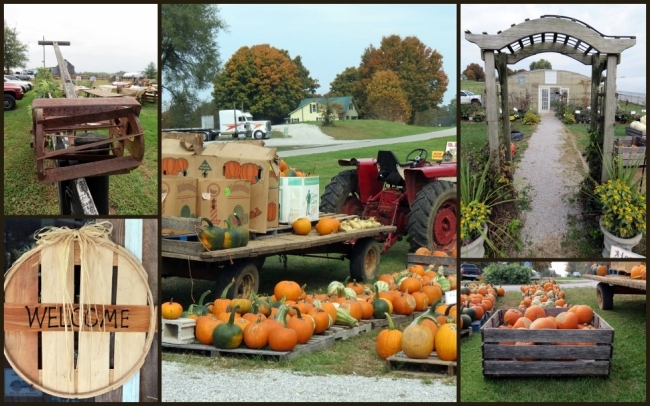 One thing to note, the owners raise their own produce to sell in season, no trips to a big box store for these folks. As a Kentucky Proud member they also feature other products native to the Bluegrass state. What began as a roadside stand back in 1992 from their front yard has evolved into the wonderful destination of today. Adding to the charm of Dennison’s is the decorating theme, Americana. While some of the pieces may be reproductions, I’m 100% sure lots of them are as old as they appear. I can remember seeing much of what they have first-hand when I was a young boy, well over a half century ago. 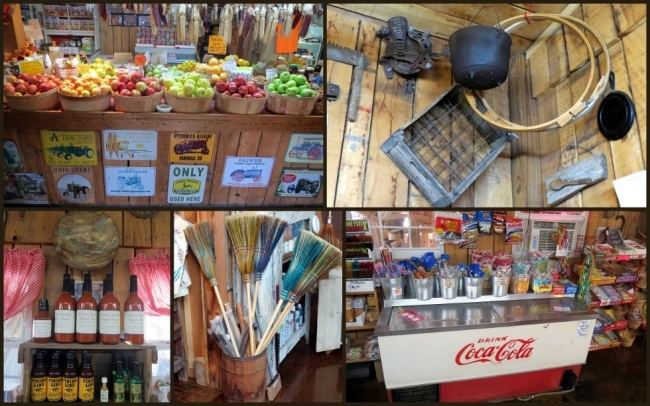 Where else that you go offers such variety as; old hubcaps, petroleum containers, handmade straw brooms, signage galore about tobacco products, antique soda signs, old tools & implements, antique farm machinery and homemade gifts. It doesn’t get anymore American than this place. 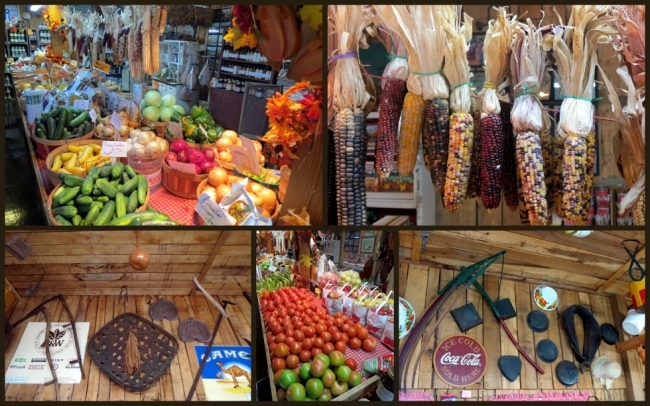 If you just happen to be in central Kentucky and have some time to kill, take the short trip from I-65 to the Market. It’s easy to find, just get off at Exit 58, head East on highway 218, passing through downtown (such as it is) Horse Cave until you get to 31-E. When you get to the light, turn right, drive for about a mile and you’ll see it on the left-hand side. If you’re using a GPS unit, the address is: 5824 South Jackson Highway, Horse Cave, KY 42749. They’re open from mid-April to December, Monday-Saturday 8 to 5 and on Sunday from Noon to 5. I’d love to give you a link to their website, but they don’t have one. I understand that they do have a Facebook page though, enjoy. 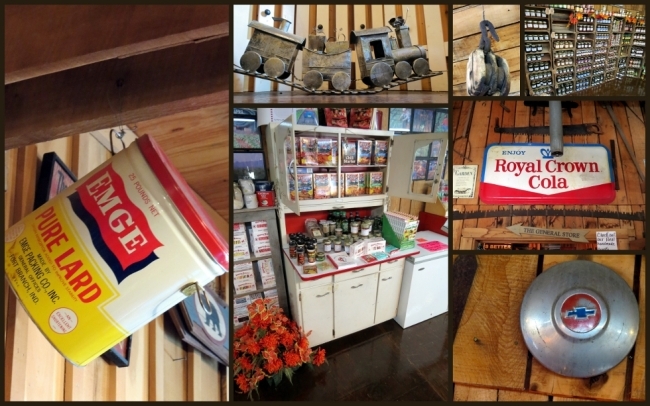 Give yourself plenty of time to browse this wonderful place, it’ll take you back in time, make for a totally relaxing day and perhaps even give you a first glimpse into our past, country style. Last modified on: November 28th 2014.